Please be aware that this script will not handle obstacles (including ladders or stairs) to get from the bank to your cooking utility. 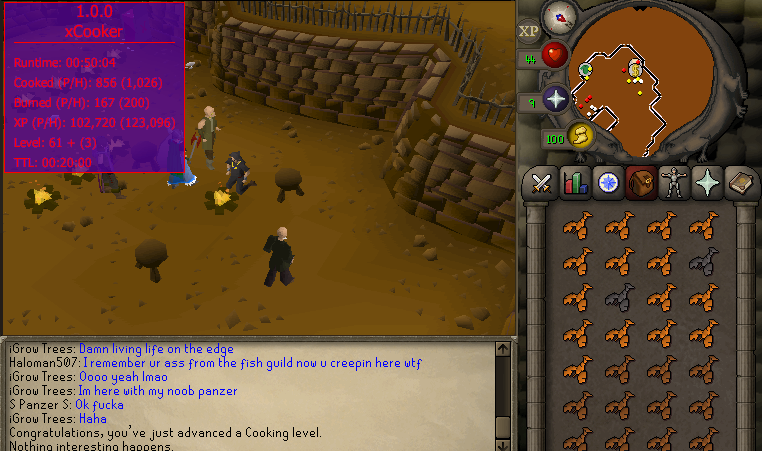 You must be cooking in a place where the bank and cooking utility are accessible by just walking without any extra interactions (such as Rogues Den, Nardah, fires people make by the Grand Exchange, etc.). Any feedback on this script? I used it myself for levels 1 through 60 in a day. It also get's a decent amount of runs per day without any posts on the thread which usually means the script is functioning perfectly. I tried to get it off of the sdn and it isn't showing up on my scripts... Am I doing something wrong? Restart the bot and ensure you added it on the scripts panel. 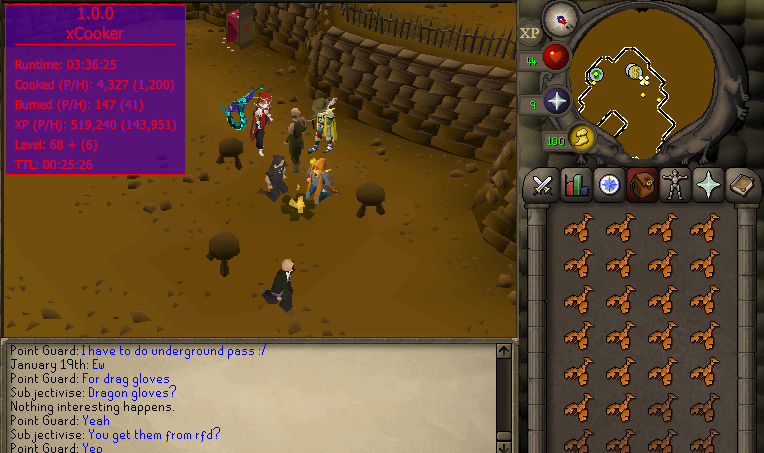 Do you just Code in OSRS? 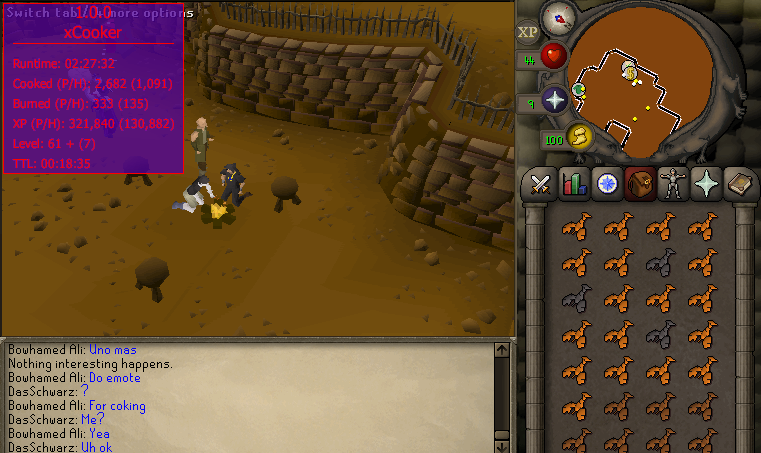 I have three RS3 scripts available. ohhh. Could my problem be that i am trying to run this script in rs3? Don't ever respond to him. He's honestly the most retarded person that has been given birth. Yes, this script is only for Old School. 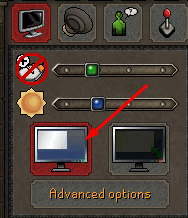 Script currently just shuts off as soon as it withdraws food from bank at rogues den. Restart your computer and try again. 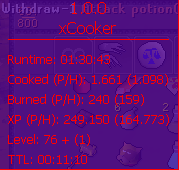 Also, it will shut off if you have no more supplies and it's the last item in your cooking queue. I will restart my computer and try again. I just started up the script, have a few k of each fish in the queue. I'll let you know if it persists still. Hmm I just tried it and it's crashing on me as well. I'll look into it right now. UPDATE: Run the script in about 20 - 30 minutes (after the server rebuilds it) and it should be functioning again. It keep crashing after 35-40 mins. How are you configuring your settings? add raw Salmon and start. Still looking for progress reports!